News > 2017 > Congratulations to the 228 award recipients in fall 2017! Congratulations to the 228 award recipients in fall 2017! All in all, 228 students were awarded $810,000 in scholarships and bursaries at ceremonies on December 5, 12 and 14. 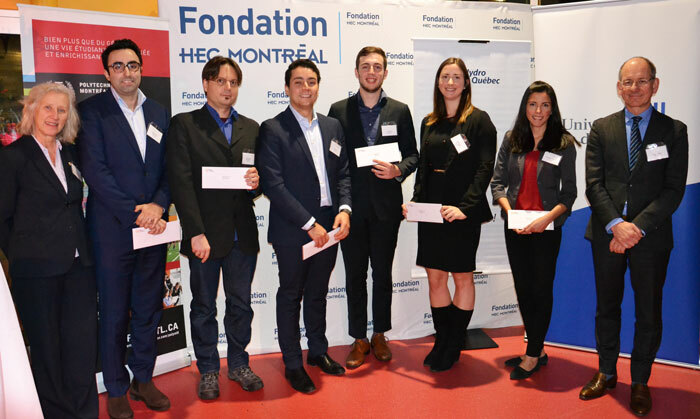 The HEC Montréal Foundation offers its congratulations to these students who, through their grades, studies, involvement or ambition, so clearly embody excellence and achievement. The recipients had the opportunity to thank donors in person and to explain the positive impact of their financial support. Many donor members of the Council of Governors, the Ambassadors Club and the Club des 100 de la Fondation HEC Montréal attended one or more of the ceremonies, and were lauded for their contribution to the success of the School and its students. “HEC Montréal is working harder all the time to consolidate its achievements, distinguish itself through innovation and train future leaders who will make a valuable contribution to the growth of our businesses and our society,” said HEC Montréal Director Michel Patry. “Our success, here at home and abroad, depends largely on you. Your contribution helps to make a difference, to enhance students’ learning experience, and to attract and retain the top students. Thanks to your support, we are continuing to excel,” he concluded. Paul Morimanno (HEC Montréal, 1959), donor member of the HEC Montréal Foundation Council of Governors, has been awarding scholarships to HEC Montréal students since 2005. He is seen here with Ariane Tremblay-Desbiens, Estefania Jauregui Castaneda, Selma Madoui and Alex Chhon. See photos from the ceremony in our Facebook album. Six students were rewarded for their efforts at the Hydro-Québec scholarship ceremony on December 5 at the School. 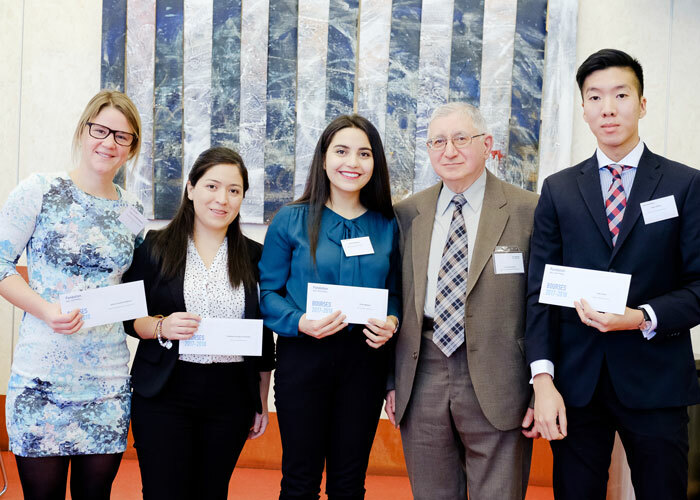 A total of $80,000 in scholarships was awarded to these HEC Montréal students who are carrying out postgraduate studies in fields of interest to Hydro-Québec. Michèle Breton, Director of Academic Affairs, HEC Montréal, with Pouya Ebrahimi and Sébastien Carton (PhD), Bachir Mouhyi, Félix Séguin, Éliane Sheedy and Patricia Amacifuen-Vilchez (MSc), and Christian Bélanger, Director of Scientific Research at the Institut de recherche d’Hydro-Québec. Peter R.D. Mackell made a $2 million bequest to create an endowment fund that provides four $25,000 scholarships every year to PhD students at HEC Montréal. At Mr. Mackell’s request, in an enduring gesture of friendship toward Peter Letko and Daniel Brosseau (HEC 1977), the fund bears their names. 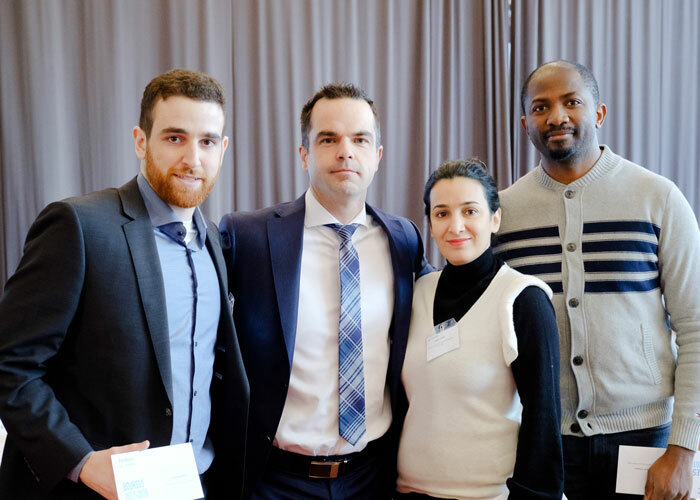 In the centre, David Després, analyst at Letko, Brosseau and Associates, with Pierre-Etienne Pilote, Pegah Sajadi and Armel Quentin Tchanou. See the souvenir program from the scholarship ceremonies!